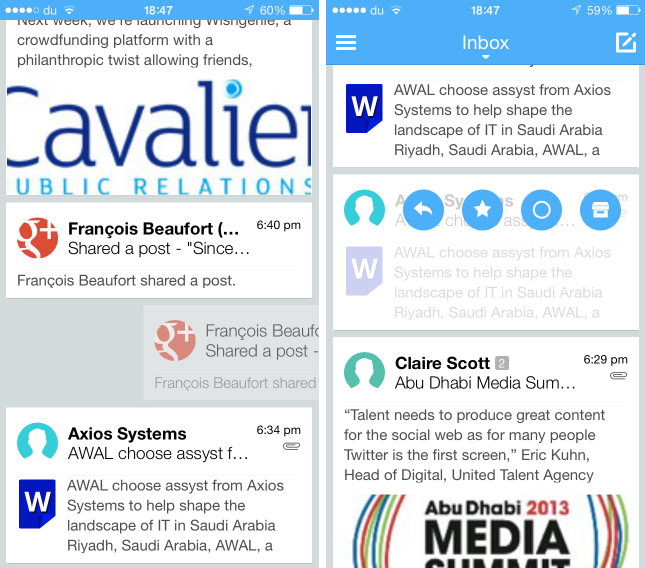 Email clients are incredibly difficult to design for mobile devices. Developers want to reject the dry, uninspired inbox interfaces that have plagued the desktop for years, boiling the UI down into an endless list of monotonous text. The challenge is finding an alternative that offers the same degree of efficiency and productivity. 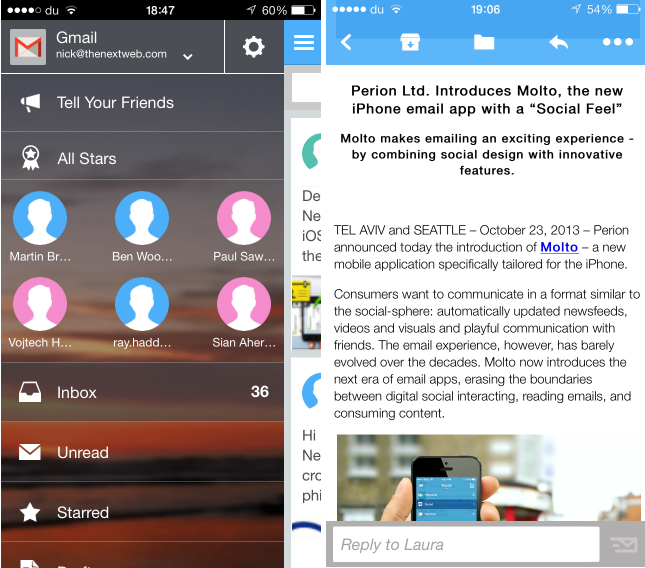 Perion, the team behind Incredimail, is trying to tackle the problem with a new email client called Molto, launching today for the iPhone, iPad and Android tablets (support for Android smartphone is in the works.) The app is designed to deliver your messages from any of your existing email accounts with a “social feel” that emulates major social networks and mobile messaging apps. The app supports Gmail, iCloud, AOL, Yahoo and GMX email accounts; Outlook isn’t on the shortlist, but I managed to add an old email address that leverages Microsoft’s email platform just fine. Molto then asks whether you would like to connect the app with your Facebook account. Such messages usually send alarm bells ringing in my ears, but here at least it has a specific purpose. By linking the two together, Molto will automatically hunt down the Facebook profile pictures of your friends and show them alongside incoming emails. 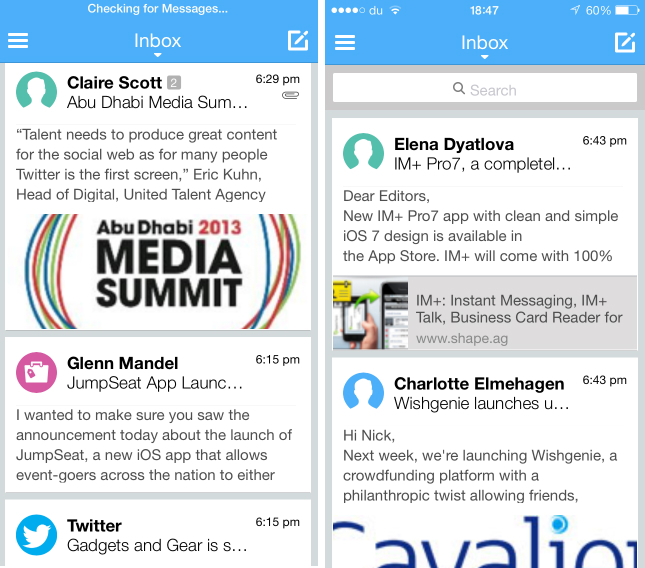 One you’re all set up, the app will throw you into Molto’s reimagined inbox. Emails are still shown in chronological order, but they’re displayed as cards in a near identical manner to Google+ on iOS and Android. Each message has the sender’s profile picture, as well as their full name, the subject header of the message and a preview of the email’s opening lines. By pinching on the screen, users can also revert back to the traditional list view found in most other email clients too. It’s also worth noting that tablet owners can use the app in landscape mode to see an assortment of different-sized email cards at once. Mailbox is the email client to beat at the moment, so like many other app developers Perion has lifted the popular swipe left or right action as a shortcut for deleting messages in Molto. 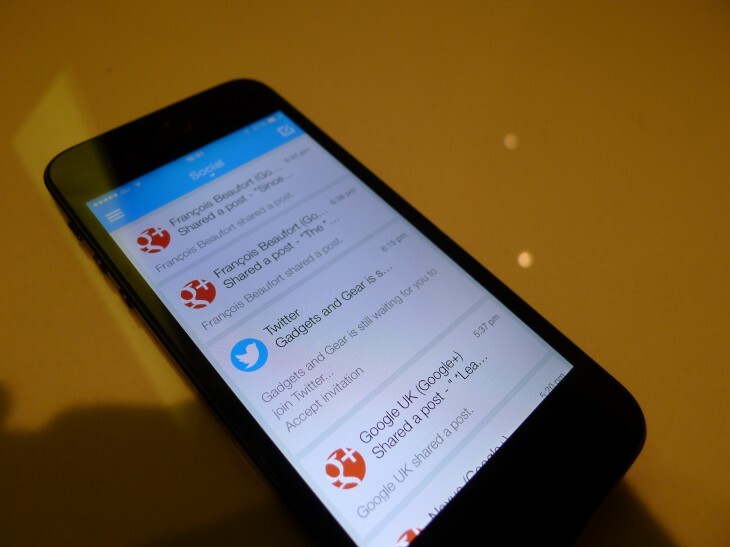 It’s intuitive and responsive, but we’ve seen it all before in other apps. By tapping on the sender’s profile picture, you can access additional shortcuts though a ‘quick action bar’. These let you reply, favorite, mark or delete a message with a single tap, which is hugely beneficial when you’re trying to quickly clear a backlog of messages. Molto’s inbox is refreshing though because it offers a preview not only of the text within the email, but also any links or attachments it contains. You can’t open them or take action on them from the inbox, but it’s an invaluable way of figuring out whether the email is worth opening in the first place. The inbox can also be filtered between various ‘smart categories’ similar to that found in Gmail, labeled Personal, Social, Services and All. The app sorts them out accurately and you can reach other inbox types such as Unread, Starred, Drafts, Send and Trash from the sidebar. Here, you’ll also find a shortlist of frequently used contacts called ‘All Stars’, which updates automatically based on your activity within the app. Molto’s design for individual email messages is clear and legible, if not particularly memorable. By scrolling to the bottom of the message, you can fire off a quick response without loading up the full version of your reply – signature, quoted text and all. Molto is targeting users who only receive a handful of emails each day. The ‘social’ design cues that Perion has implemented are novel and offer a compelling alternative for people who want a more visual, light-hearted experience on their iPhone, iPad or Android tablet. For everyone else – power users especially – Molto can feel at times overly simplified and inefficient. Selecting multiple emails in the inbox can be a little tricky and – even in list view – you just can’t see many emails on the screen at once. Perion has an interesting concept here, but it doesn’t trounce Mailbox or Google’s own Gmail app just yet. Disclosure: This article contains an affiliate link. While we only ever write about products we think deserve to be on the pages of our site, The Next Web may earn a small commission if you click through and buy the product in question.